Colorado wildflowers fill the apline tundra and rocky slopes of the saddle heading up to Notch Mountain. In the distance is the famous cross of Mount Holy Cross. After being first photographed in 1873, this snow cross became a mecca for pilgrims - so much so that a shelter was constructed by the CCC between 1931-33 for those making the climb. 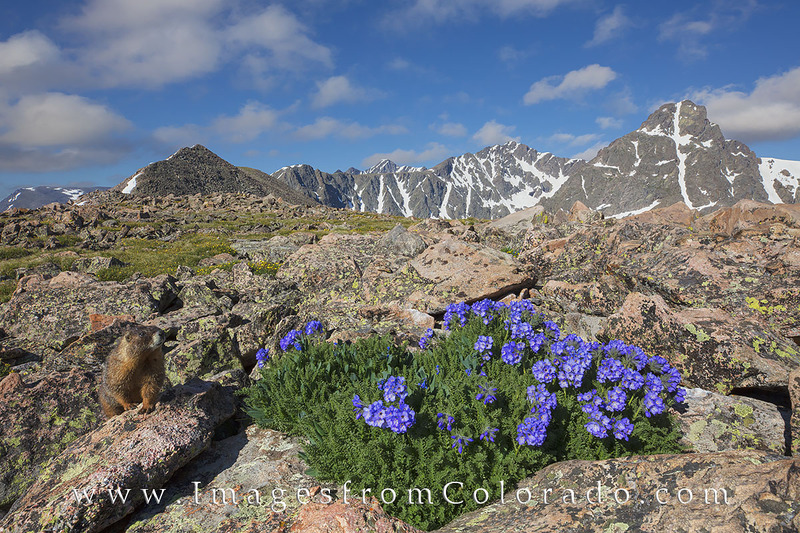 While photographing this view, a curious marmot came to investigate. He followed us around, to the point of digging in our backpacks when we were not looking! Photo © copyright by Rob Greebon.